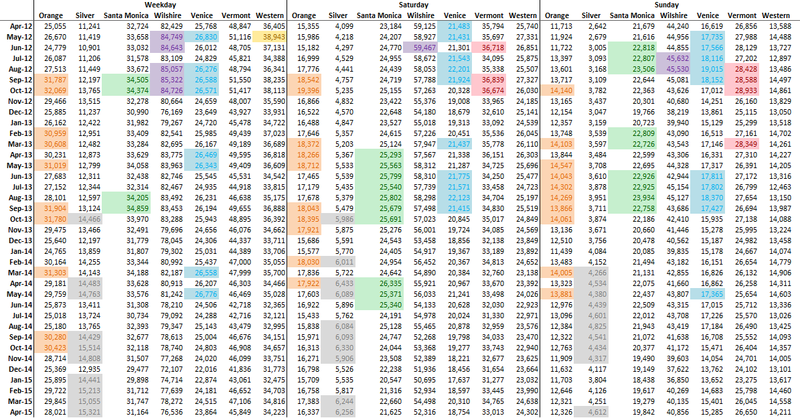 Another three months has passed, so it’s time for another LACMTA bus ridership update. First, the raw data. Highlighted cells represent the top 10 months for that route (since January 2009). 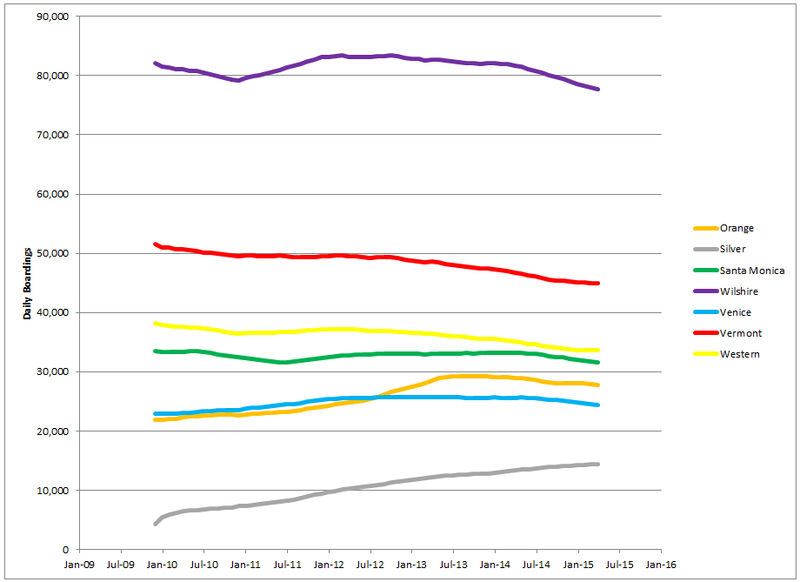 Here are the 12-month rolling averages. 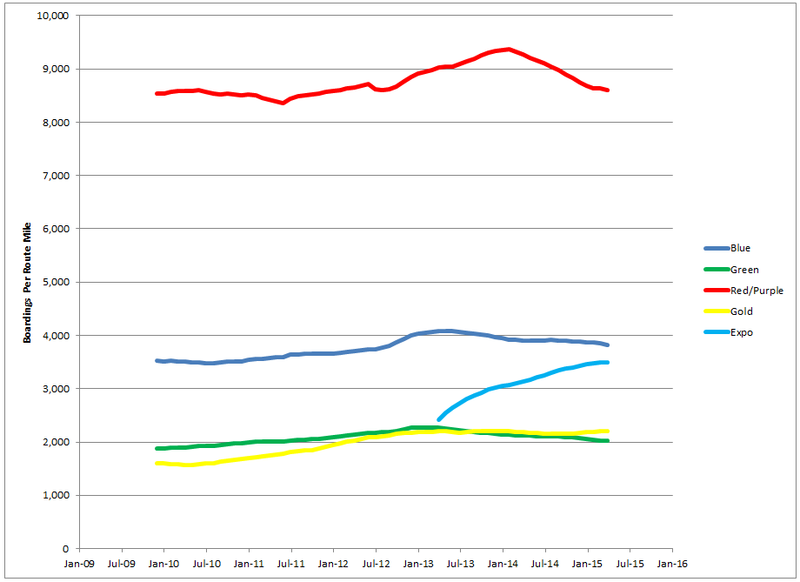 Here’s the Saturday and Sunday rolling 12-month averages. 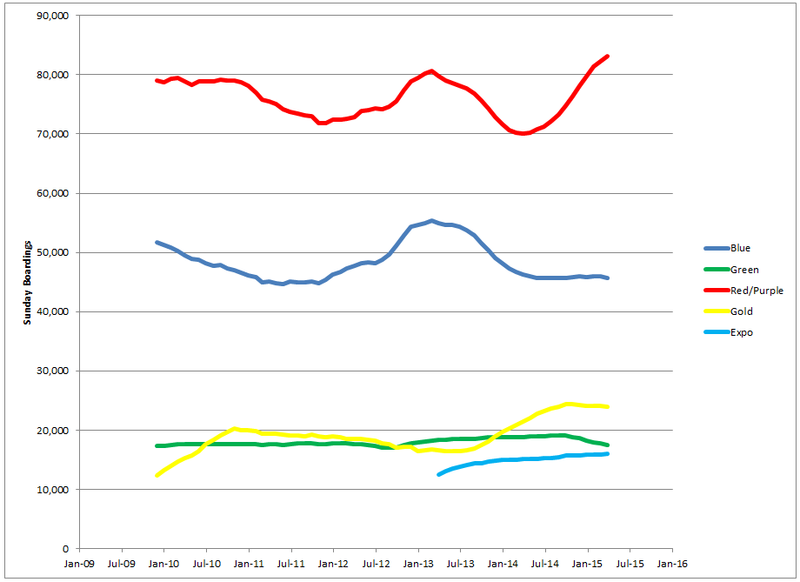 Saturday and Sunday ridership largely reflects the weekday trends. 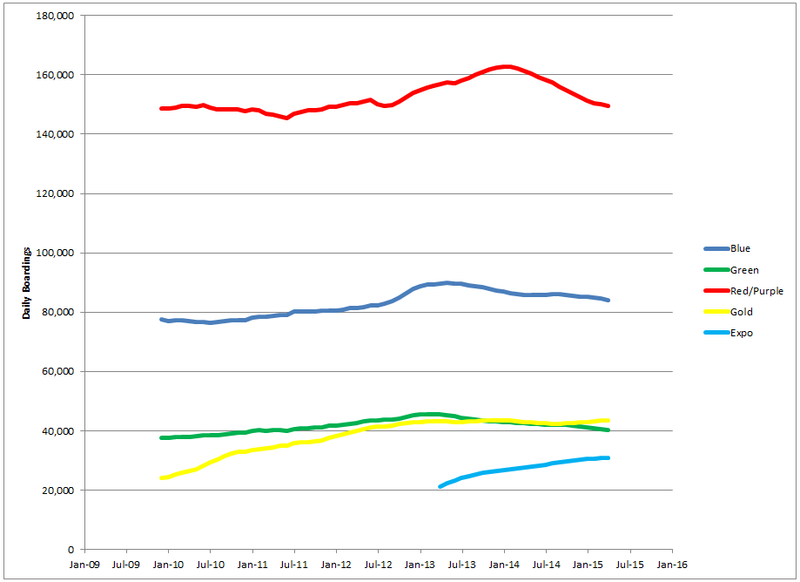 Unfortunately, most lines have continued to see slight decreases in ridership. The exception is the Silver Line, where ridership continues to grow. There’s also been a leveling off of ridership on Vermont and Western, so maybe things will start to turn around. Lastly, here’s the percentage of trips on each arterial being served by the rapid route. 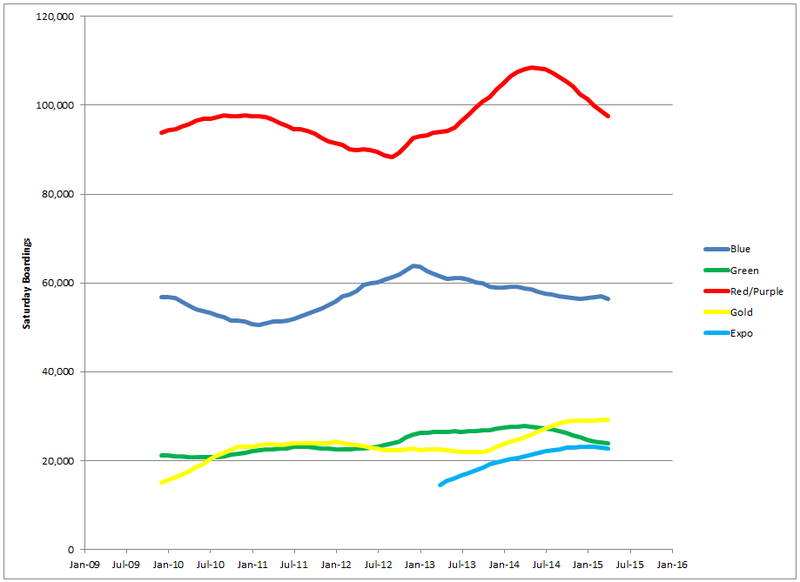 The share of riders served by the rapid routes continues to slowly rise on most corridors. Again, I wouldn’t read too much into the spikes in Venice and Santa Monica data, because they were caused by large drops in local route ridership on those streets. However, it is interesting that the rapid routes were more resilient to ridership changes – the ridership losses came disproportionately from local routes. As always, it’s hard to say what’s causing ridership changes. Possibilities include the improving economy making cars more affordable, cheaper gas, and Metro’s recent fare increase. Next up, Valley bus ridership, and then Metrolink. This entry was posted in Uncategorized and tagged LACMTA, ridership, Westside on June 28, 2015 by letsgola. Another three months has passed, so it’s time for another LACMTA rail ridership update. As a reminder, bus ridership for the Westside and San Fernando Valley has been broken out into separate posts, which will follow shortly. 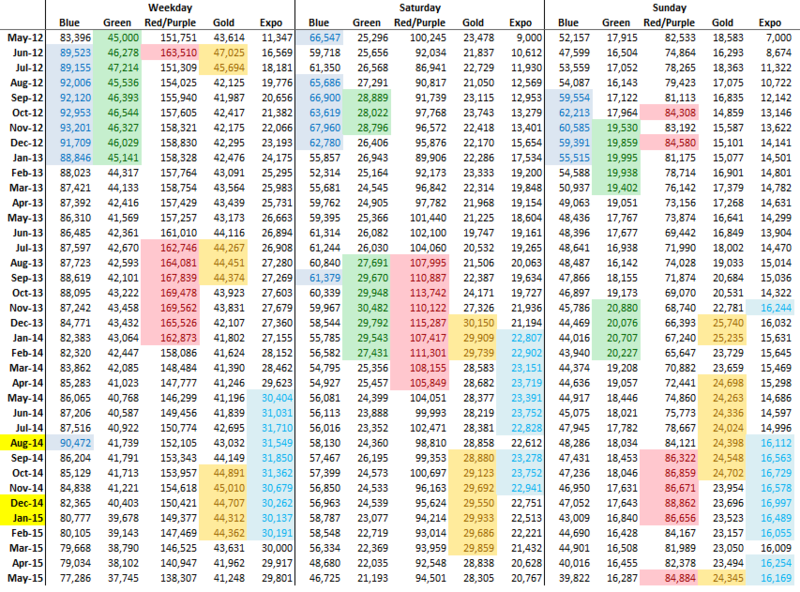 First, the raw data. 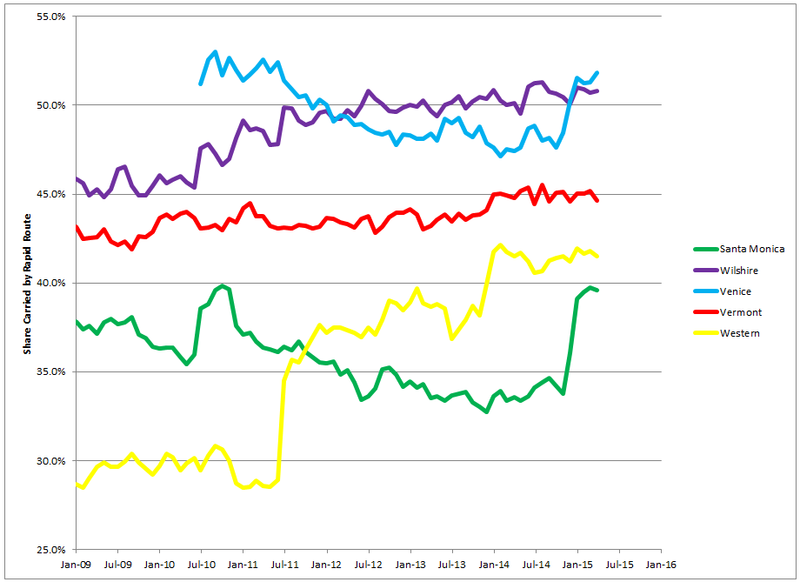 Highlighted cells represent the top 10 months for that line (since January 2009). Last time we looked, we noted that the January 2015 data looked very suspicious, and indeed, ridership data was revised for August 2014, December 2014, and January 2015 for all lines. Some numbers were revised up and some down, but in general they were all revised towards being less outlying data. 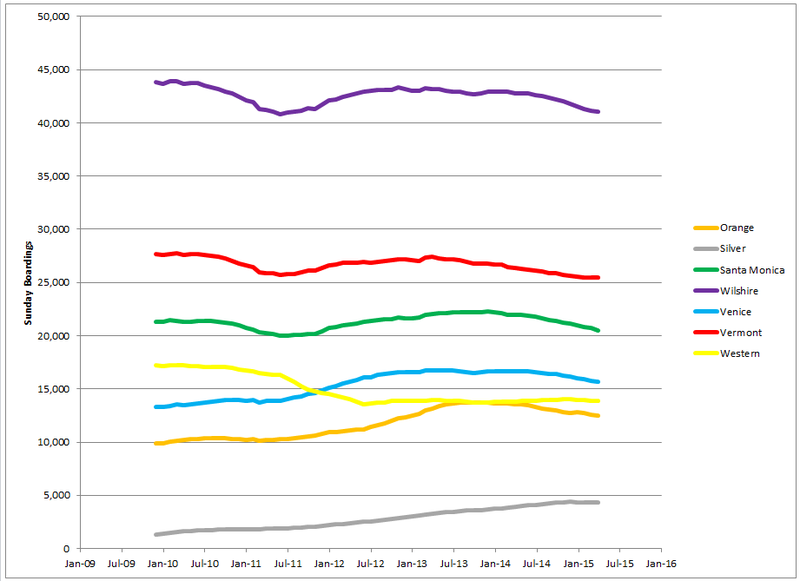 Recent trends have continued, with the Blue, Green, and Red/Purple Lines continuing to slip a little. The Gold Line and Expo Lines continue to be near, though not at, all-time highs. 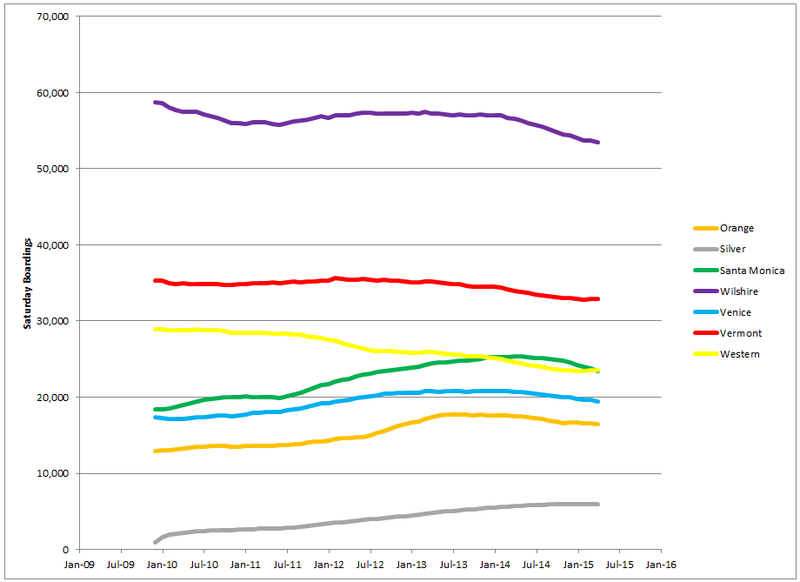 Expo Line ridership appears to have leveled off, which we can see in the rolling 12-month averages. As noted previously, some of the drop in the Blue and Red/Purple Lines may be due to ongoing construction that has increased late-night headways and shut down portions of the Blue Line at times. Again, Expo Line ridership is leveling off. The relative quiet continues while we wait for the Expo Line and Gold Line extensions. This entry was posted in Uncategorized and tagged LACMTA, ridership on June 16, 2015 by letsgola. In a city with an established transit system based on an efficient grid design, it’s not often that you come across logical bus routes that don’t already exist. In Los Angeles, they usually relate to jurisdictional boundaries that have ceased to be relevant to most people’s lives: for example, the lack of continuous bus routes on Olympic and Pico between downtown LA and the Westside, or between the Valley and the Westside via Sepulveda Pass. However, two such potential routes recently popped up in discussions on a better connection between Silver Lake and Los Feliz. The (neighborhood transportation committees) suggested LA Curbed on Dash routes, operated by the City of LA’s DOT, creating a U-shaped route running along Vermont, Fountain, and Hyperion, ending near Griffith Park Blvd. This route will likely underperform, like the Dash routes it is proposed to replace, because of basic geometry: almost no one wants to travel in a U-shaped path. In fact, the current underperformance of neighborhood Dash routes, in turn, may be due to similar route geometry. Local circulator routes are generally a dubious bet, especially outside of central business districts. 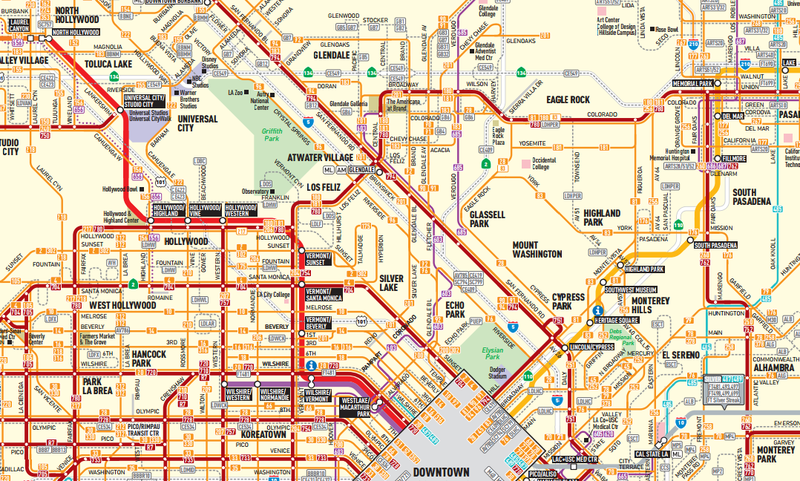 An existing LACMTA circulator route here, the 175, gets only 600 riders per day. If the intent is truly to improve connections to Los Feliz and Silver Lake, there are two options that would improve both connections within the neighborhoods and connections to the rest of the city, increasing mobility and opportunity for transit users. First, let’s have a look at service in the area today. Something in Los Feliz, Silver Lake, and Echo Park area should jump out at us right away: a significant weakness in the east-west grid. This may be due to leftover historical influence of transit orientation towards downtown LA, or the underlying weakness of the east-west street grid, but whatever the reason, there is an opportunity to strengthen the bus grid, and provide a direct connection between major activity centers around Hollywood and east side neighborhoods like Glassell Park and Highland Park. The less ambitious route would start at Fountain & Western, run east to Fountain & Hyperion, follow Hyperion to Atwater Village, and end at Brand & San Fernando in Glendale. Since this would a totally new route, there’s no need to follow outdated stop spacing practices, and we can set stops at every quarter to half mile to improve speeds. A westward extension all the way to La Cienega would be nice, but that would depend on a contentious plan to build the missing block of Fountain. Maybe it would be more feasible if it were restricted to buses only? A more ambitious route would follow the above from Fountain & Western to Hyperion & Rowena, and then follow Rowena, Glendale, Fletcher, Eagle Rock, and York to Highland Park. The Highland Park end of the route would be tricky, because of the need to provide a transfer to the Gold Line and the absence of an ideally located station for that purpose. Avenue 54 is a logical cutoff from York to Figueroa, but leaves you 4 blocks south of the Highland Park Gold Line station, while taking York right to Figueroa leaves you 3 blocks north. Taking York and Mission to the Gold Line station in South Pasadena would make the route useless for transfers between the Gold Line to the south and the new bus route to the west. Because of topography, the street grid in this area isn’t great for east-west movements. This results in a longer route with more turns than we’d like, but it’s probably about the best we can do. This route would provide an alternative this route would be competitive with taking the Gold Line to LA Union Station and transferring to the Red Line, and would serve intermediate destinations not served by rail transit or existing east-west bus. While it certainly wouldn’t be one of LA Metro’s top performing routes, it should connect strong enough destinations to generate decent ridership, and is worth taking a look at. This entry was posted in Uncategorized and tagged bus, Highland Park, Hollywood, Los Feliz, Northeast LA, Silver Lake on June 8, 2015 by letsgola.